Votacall VoIP now Seamlessly Integrates with Zendesk. We just released released Votacall Unity for Zendesk. 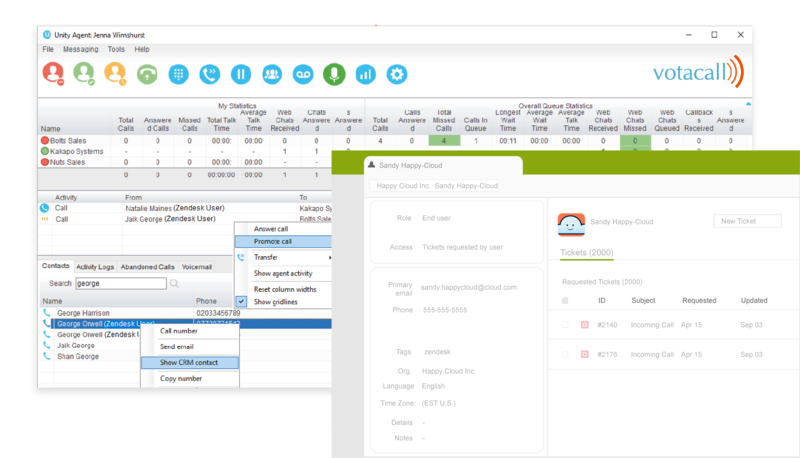 We're really excited to roll out the app, which delivers seamless integration between the Votacall Cloud PBX and the Zendesk CRM. By meshing two crucial business productivity tools - the communications and CRM platforms - we've created a game-changer for any organization that's looking for a competitive edge in its industry. Unity for Zendesk elevates the user experience by creating efficiency and visibility across your most important customer-facing tools. Because it's fully integrated, it also doesn't take much time to get your staff up and running. Question: What's more important than Productivity? Answer: Productivity made simple, which is always our goal. The Votacall Unity integration for Zendesk empowers your team to deliver an unrivaled support experience, allows your admins to make more informed support decisions, and most importantly, delights your customers. Votacall is a leading provider of Cloud-based voice solutions and business communication systems with an expertise in VoIP, Unified Communications (UC) and Call Center design and deployment. ©2019 Votacall, Inc. All Rights Reserved.